Welcome to a 100% frill-free post*. One list, ten songs, absolutely no justifications. Let’s go! * Technically, if you count my decision to count this top 10 down backwards, there is one measly flourish. Don’t pretend you don’t love suspense. I’ll show you mine if you show me yours. What are your favourite Junior entries? 2009 – as long as we are talking musically, and not about the hosting/interval acts (the latter of which were mostly great, but dragged down by the horror of Ani Lorak’s terribly mimed performance). My personal favourite entries from Kyiv would be all but one or two, but so as not to bore you into sleeping and dribbling on your keyboard, here’s a selection: Sweden (Du), Russia (Malenkiy Prints), Armenia (Barcelona), the Netherlands (Click Clack), Ukraine (Tri Topoli, Tri Surmy), and Belgium (Zo Verliefd, which remains my #1 entry of all JESC time). Well, apparently I really don’t think the Belgians/Dutch get enough Junior credit, which seems odd as both Belgium and the Netherlands perform much better in JESC than ESC. Anyway, Anders has popped up a few times over the course of this challenge, and that is because I love it unconditionally. If ‘underrated’ means a song should have been so much higher on the scoreboard, then this is the very definition of the word. Yes, you can argue that it was too adult to appeal to Europe’s young folk, blah blah…but I’ll still think 15th place was a travesty. Especially in light of the fact that Malta finished 12th with a song that makes me want to do a Van Gogh on both of my ears just so I don’t have to be subjected to the torture of hearing it. What do you mean, how dare I assert that a brace-and-trilby-wearing entertainment machine should have beaten a trio of buzzing brats in bug costumes? I would have thought it was quite obvious! (PS – I don’t condone my labeling of Bzibeki as brats, but it made for such lovely alliteration I couldn’t write anything else). Phew! That’s my second song challenge of 2011 done and dusted, and in good time too, because next week is Junior Eurovision week! It’s my second favourite seven days of the year, and there’s some serious non-challenge JESC business to take care of during. I also may have to spend a large portion of the week sleeping in preparation for getting up at 2.30am to watch the contest – but that’s another story. 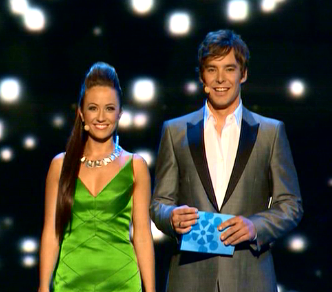 I’m pretty sure these two wrote Hosting Eurovision In A Genuinely Comedic, Enthusiastic, Engaging and Professional Way Without Making The Home Viewers Want To Thrust Their Fists Through The TV Screen: For Dummies. Bravo, and douze points! There’s always a shining beacon among a trio of hosts and in Oslo it was Eric, who provided some much-needed comic relief by donning a Milan Stanković wig and InCulto hotpants (I’m still wondering where you buy those), among other things. But the ladies were faultless, despite begging the question, “Why so serious?”. I’m still not entirely certain that Mr. Abay was alive back then, but he did a pretty good job of compeering alongside Miss Cumbul. I particularly liked their banter about George Clooney and Pamela Anderson (the resemblance is uncanny!). If it’d been Anke on her own, she’d be at the top, but as it is she can thank Judith (who I’m sure is a great news presenter but at the ESC had all the enthusiasm of Norway when they discovered they hadn’t qualified) and Stefan (who needed to be surgically removed from his guitar) for dragging her down to 4th place. There’s little I love more than hosts presenting a pre-shot fantasy sequence of themselves singing an ode to their ‘love’ and laughing gaily when one catches the other in a face pack. Amazingly 2002 gave me exactly that. Very sweet. These two weren’t bad, but I reckon they should stick to their day jobs if Eurovision lands inSerbia again in their lifetime. If you look up ‘Painfully scripted dialogue’ in the dictionary, there’s a toothy photograph of this duo underneath it. Great show, Greece. Not so good = the presenters. Did Maria know what Eurovision was before she was asked to host it? I’m not sure. Her partnership with Greek god Sakis was a bit of a shambles in any case, with plenty of stumbles to go round and a cringe-worthy lip-sync from his end. Alsou and Ivan were perfectly adequate hosts, but they pale in comparison to the horror show (or lust-fest, whichever you prefer) that was the Supermodel and the Sleaze of the Semi Finals. Shudder. I’m sorry, but if I’m watching the ’03 contest and there’s a wall nearby, it’s usually less than a minute after Marie and Renars emerge that I’m driven up it. I wasn’t a huge fan of (read: I really hated) the former’s winning song, so it was easy to turn my nose up at her hosting skills. But I loved Renars in Brainstorm! Perhaps that’s the kind of fronting he should stick to. Just to let you fellow Eurovisionaries know: I’ve made it my mission to blog all year, every year, which can be a tough ask when there’s little happening on the ESC/JESC fronts. But I do have a bunch of random posts lined up, so I thought I’d do up a little schedule to keep you informed of when to expect them, if you’re interested. Remember, it’s two or more a week in twenty-eleven! And of course, a surprise post anytime if I feel like it! Stay alerted by following EBJ on Twitter, liking on Facebook (links in the sidebar) and/or subscribing (link at the bottom of the page). What are your most played Eurovision songs? Let me know! 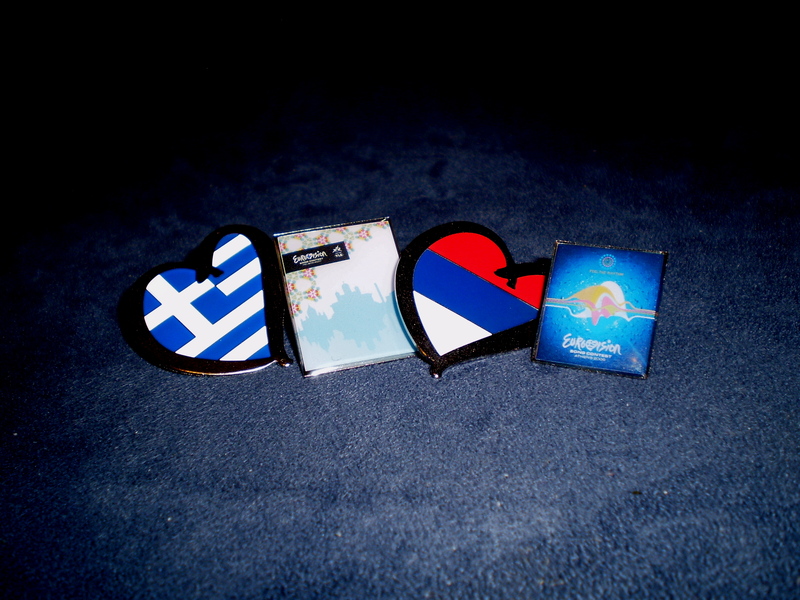 The pins: These (from left: Athens 2006, Helsinki 2007, Belgrade 2008 and Athens again) came from the official Eurovision.tv shop, in a surprise package. All you do is order it, and you get a bunch of random items in the mail - merchandise from the last few years - for a great price. There is a risk in that you may receive something you already have (like me) but it’s often worth it. I can’t say I’ve worn the badges yet, but I may have to decorate myself with them this year, as they’re less messy than writing ‘GO TURKEY!’ across your forehead with eyeliner as I did in 2010. The podcasts: It’s a long story as to why I have these on disc instead of on my iPod, so I’ll try to condense it for you: Chapter 1) They are comprehensive, which is fabulous, but they take up a LOT of room on any device, and my iPod eventually gave me an ultimatum: ‘It’s me or the podcasts, Jaz!’; Chapter 2) I deleted them from said device, but wanted to keep them to listen to again (and again and again); Chapter 3) My laptop is unreliable, having had a meltdown last year of epic proportions. It’s not been the same since, and I didn’t want to risk losing all the podcasts and have to download them all again; Chapter 4) So I burn them onto CDs as I see fit. The End. Get the SBS and ESC Today podcasts on iTunes, and the ESC Insight podcasts at escinsight.com, or iTunes…for FREE of course. The CD’s: I’ve only recently completed my official album collection (sans 2011, of course), which consists of: 2000-2005 which all came from eBay and together cost me under $50 AUD which is AMAZING; and 2006-2010 which came from both the Eurovision.tv shop, Amazon.co.uk, and music stores here in Australia. I love having them all, not just for display purposes, but because many of the songs from the earlier 2000s aren’t available on iTunes over here. Those CDs are becoming harder to get, but I suggest eBay as a first resource every time, as it is so cheap, and if you pick a reliable seller, you always get what they say you will. My 2001 and 2004 albums cost about $20 AUD…together…including postage. Hence words cannot express my love for eBay. 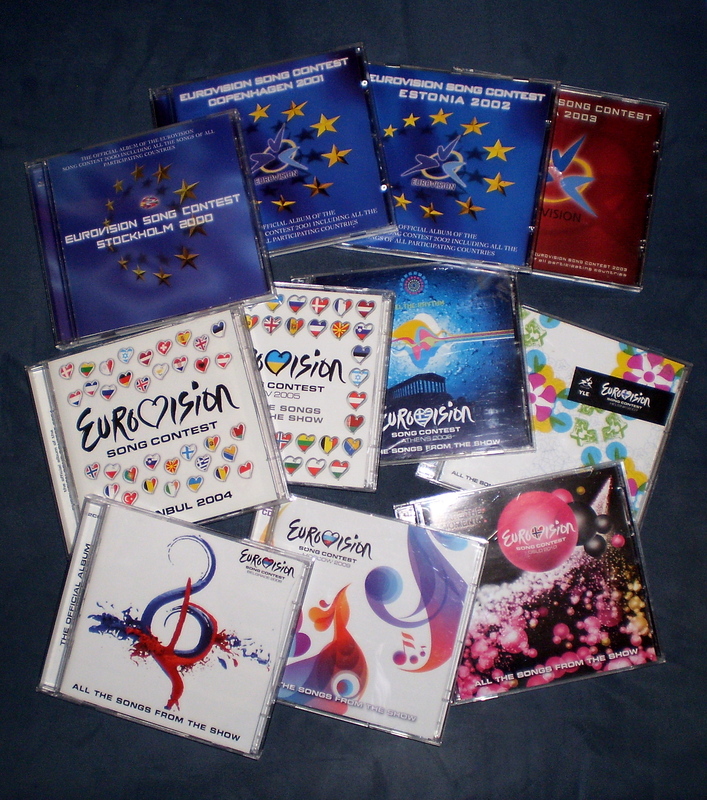 The ‘other’ CD’s: The first two are: The Very Best of the Eurovision Song Contest from JB Hifi; and Ultimate Eurovision Party from amazon.co.uk. If I had to suggest to you one to get, I’d go for the former, as it features a lot of winners, and all the unforgettables, whereas I think the Party CD originated in the UK, as it’s very biased. It considers James Fox’s Hold On To Our Love a party anthem…still, both are great listens. 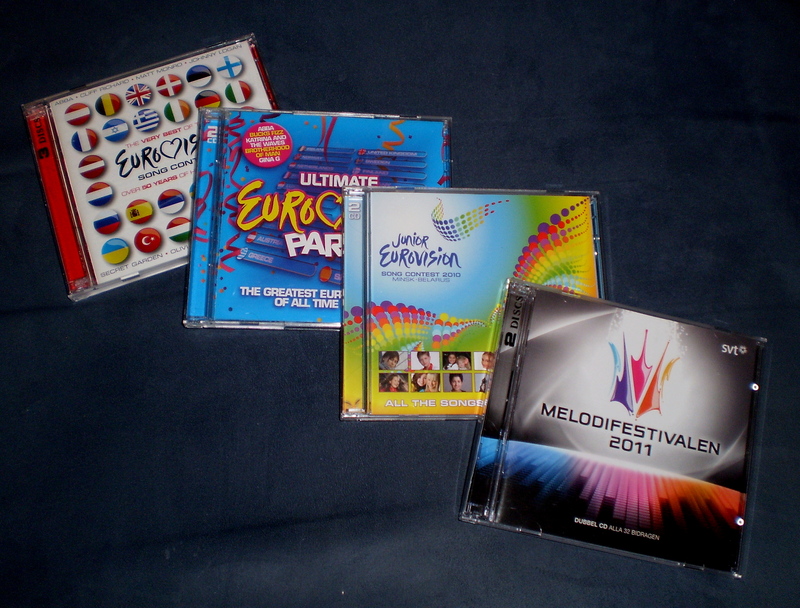 Lastly, I have: Junior Eurovision 2010 from amazon.co.uk; and Melodifestivalen 2011 from ebay.com.au. I’d never considered buying the JESC or Melodifestivalen albums before these, but I felt both were so strong that I couldn’t go past them. 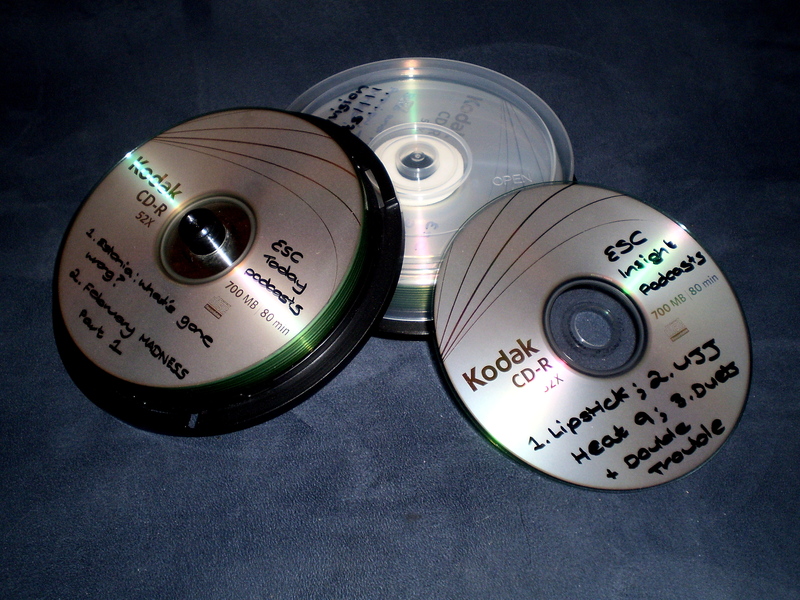 The videos: Now, before you go emailing the EBU and telling them to arrest me for copyright infringement, I assure you that these are for my private, in-home use only. 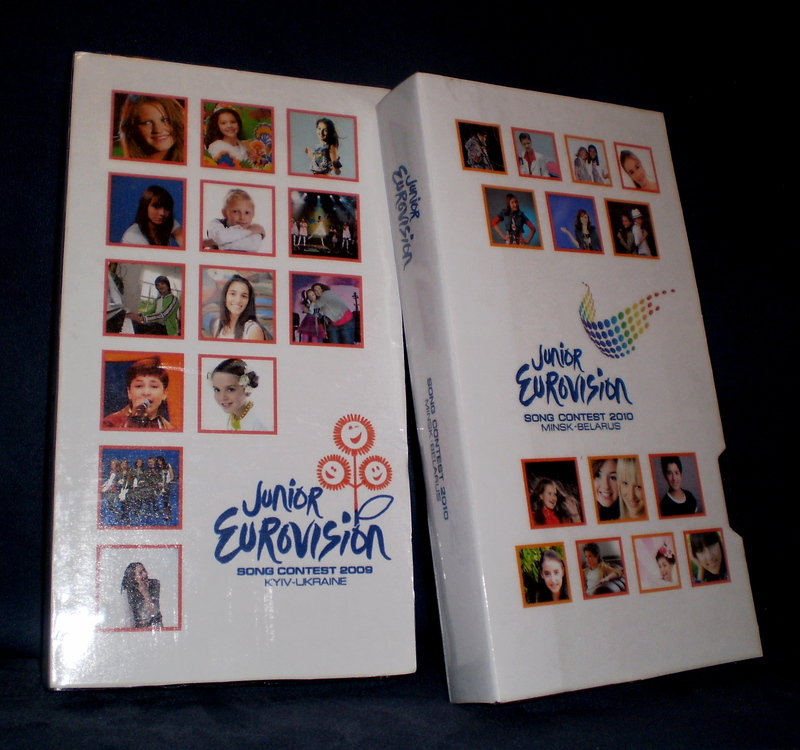 They are the 2009 and 2010 editions of Junior Eurovision, taped from TV onto trusty VHS and covered to look decent by moi. Sorry for the layout of this post, but I’m having trouble with the graphics/text combo at the moment. Anyway, this is Part 1 of my ESC haul, which is something that I’ve wanted to do for ages, ever since I became obsessed with watching haul videos on Youtube. For those of you not clued-in to the trend (I for one was quite behind on getting into it), hauls are basically: random people uploading videos where they show you what they bought on a shopping trip, or got for Christmas, or have collectively amassed over a long period of time, and where they got it. My Eurovision merchandise has been collected over a long period, and though I have done a collection blog before, it has gotten a lot bigger since then – so I wanted to show you how! This is a true haul however, so not only will I be showing you photos of the stuff, but letting you know exactly what I love about it, and where I got it from. So if you’re missing anything from your own hefty pile of ESC trinkets, I hope I can help you out. I haven’t got any 2011 things yet, so don’t call me up on that! If you think I’m missing something that every fan should own, please let me know here or via Facebook/Twitter (you can find the links to both of those on the sidebar). And of course feel free to chat to me about anything else ESC. Hauls are great, but they often attract a lot of negative attention from people who think showing off what you own/have purchased is, well, showing off. This is in no way what mine is about. All I want is to give you a look into the ESC side of my life (a large side!). So if you don’t like this sort of thing, don’t read! But if you do, look out for Part 2 soon. PS – There’s 10 days until Semi Final #1, and the rehearsals begin on Sunday. It’s really happening! You can download the full (and very complicated) rehearsal schedule from eurovision.tv to see when your country will take to the stage for the first time. Dana International: back, and Hungary for success! Boom boom, ding dong, da da dam!!! What’s that noise? Oh, it’s just Eurovision 2011. Among other things (including, apparently, a throwback to the onomatopoeic song title fetish of the seventies) this year’s contest is a year of familiar faces: from Lena, Dino Merlin and Zdob şi Zdub, to that guy from Two Tricky who is reappearing for Iceland, a fact we would never have known if Wikipedia hadn’t told us: they’re all there, and that’s not counting those who entered the national finals. Now another living piece of contest history (and some competition for Lena in the ‘I’ve reached the top but I still want MORE MWAHAHAHAHAHAHA!! !’ category of participants) is back in the mix for Israel – yes, it’s the transsexual with a better body, hair, skin, nails, and more impressive wardrobe of dresses than yours truly: Dana International! I absolutely LOVE Dana, and to make things even better, I also love her song Ding Dong (a lot more than Boom Boom and Da Da Dam, FYI). Israel’s Kdam last night was one of the stronger national finals I’ve seen this year, with great songs from Adi Cohen, Chen Aharoni, KNOB (ha ha! ), Hatikva 6, Idit Halevi…basically all ten entrants! I know many people were impressed with the lineup, but also worried that it would be a given for Dana to triumph because she is Dana, and for no other reason. However I firmly believe this infectiously catchy song deserved to win, and although it’s in a difficult semi final, has a fair chance of qualifying. Sure, maybe if someone else had sung it it wouldn’t have pipped the Taylor Swift-esque, poppy ballad from Idit – but who else would we WANT to sing it? I can’t wait to see the first lady of Divaliciousness back on the Eurovision stage again after her 1998 win, and then her cameo a decade on as songwriter for Boaz (my favourite song of Belgrade). It’s safe to say we can expect an exciting stage show from her, with or without the feathered Gaultier! As for the song, I’m going to go ahead and give it the douze points – I think it’s a cracker. It’s a slightly less thrilling entry too, another of those “not bad, not great” songs in my opinion – at least for the moment. The chorus is quite strong and thumping (and a little bit retro) but doesn’t really keep my boat afloat. Hungary is in the less competitive semi final 1, so this may be enough to get them through…what do you think? Personally, I’d give it 5 points. In other, potentially more-thrilling-than-the-last news, this Friday brings the moment so many Eurovision fans have been waiting for: Blue’s appearance on The Graham Norton Show, and with it the premier of I Can! Ironically, I CAN’T wait to hear it, although I am worried my expectations are too high – this is the UK we’re talking about here. Then again, this is Blue we’re talking about here, and as any late teen/early twenty-something female who grew up in the 90s will tell you (including Lena), they were awesome! As long as they still are, and the song is worthy of at least 8 points, this fan will be happy. Also on Friday, San Marino chooses their song, whilst Saturday, the last Saturday before the selection deadline, will see not only Sweden but Russia and Azerbaijan finish off. So long as Belarus decides what they are doing (to disqualify/change the song, or not to disqualify/change the song? That is the question), Monday morning will dawn with all 43 songs locked in, and the long-awaited running order draw ready to go ahead. But the excitement doesn’t stop there, as the countdown continues, and we prepare to find out where 2012 will take us…..
Is France too good for Eurovision, or just good enough? I have to point out that this is the polar opposite of France’s entry from last year, which I have to confess I shook my thing quite vigorously to. Unfortunately, there will be no shaking of any body parts to this number – but what a number it is! The juries will be in a frenzy over this dramatic, climactic piece of opera, and the response from fans has been positive so far too, which bodes well for another one of those countries that has struggled to win people over in the contest for a while. Mr. Vassili’s voice sounds like it should belong to a middle-aged, overweight Italian man with a moustache, which also works in his favour, making him resemble the rich man’s Didrik Solli-Tangen (no offence to my darling Didrik intended). But can these elements really come together to make a winner in this day and age? As I mentioned, fans have reacted well to this song, many proclaiming it as ‘The One’. However it strikes me as a song that will be lifted into the top six or so by the juries and some enamored voters, but will be pipped into the top three, and indeed to the gold medal, by something more stereotypically Eurovision – think Patricia Kaas, whose 2009 sixth place was a boon for France, but whose cabaret-inspired chanson was never going to outrank Norway or Iceland, songs that catered better to modern ESC tastes. How dare you...my hair is MUCH more luxurious than Eva Rivas'! Lots of people have also stated that Sognu is “too good for Eurovision”. But I don’t believe there is such a thing! It is a song contest after all, and that allows anything, no matter how lyrically or musically substantial, or clichéd and novelty, to participate. Sure, we all know that the contest is not always about substance, but it has always brought us diversity, not just in style but in quality. What makes this song “too good” in comparison to Serbia and Montenegro from 2004? Or Amina Annabi’s entry back in 1991 which very nearly took out the top prize (and was also described as being too superior to participate)? Or even Patricia? Maybe is it simply the opera genre that has people saying this, as it is one that holds more credibility than your average pop or rock song. I’m sure there will be people out there who can’t stand this entry and wouldn’t dream of insinuating that its standard would be lowered by being in Eurovision. Then again, saying that a song is too good and implying that it won’t succeed is also implying that Eurovision fans don’t have the capacity to appreciate more credibly perceived genres and therefore vote for them. And that is just not true, a fact proven by the great results of the songs I mentioned – and many more that I didn’t. Anyway, I just wanted to have that little rant. My personal thoughts on the song are that it is perfect for Eurovision – it really hits the aural heights, and will do a nice job of breaking up the pop/rock/ethnic/ballad numbers that will fill up the final, giving us a full smorgasbord of musical treats to look forward to! Whilst the straight opera genre is not my preference to listen to (I do like a bit of popera, though), it’s music to my ears, quite literally, when combined with all of those other genres on the Eurovision stage. So I’m giving it 8 points. Before I go and do some coursework (a.k.a. what I SHOULD be doing at this moment), I’ll just mention the upcoming action in National Final Land. Israel’s lineup go head to head this evening in Kdam, one of which is Dana International. Will her song Ding Dong get her back in the fold, or will it be a new face (and a more promisingly titled song) we see in Germany for the Israelis? 12 hours or so, and we will know! According to the free (code for: extremely unreliable) encyclopedia, Hungary will make their internal selection tomorrow, so look out for that, before the UK FINALLY presents I Can on Friday, joined by San Marino and Senit. Saturday brings us, if all goes according to plan, the final two selections/presentations, with Sweden’s Melodifestivalen final (also known as The Eric Saade Show) and Russia’s revelation. Six songs, six countries, six more possible winners – I’m excited! Keep dropping by for my verdicts, and all the fun of the lead-up to Düsseldorf. It’s a great Sunday morning for Eurovision fans! Super Saturday is over and now we get to enjoy the fruits of its labor. DENMARK/ A Friend In London/ New Tomorrow: I was pleasantly surprised by this song, considering I was hoping to see Anna Noa and Sleepless represent Denmark. It could have come from anywhere musically (though its ambiguity in that sense could be a good thing), but it is a nice anthemic pop-rock number and something a little different from the Danes. Right now I’d give it 6 points. ESTONIA/ Getter Jaani/ Rockefeller Street: This song was always the one to beat in Estonia, and unfortunately for the other finalists, they couldn’t! It’s one of Estonia’s stronger entries, composed by Sven Lõhmus, the man behind Urban Symphony’s breathtaking Rändajad from 2009 – very catchy and fun, well performed and has the perfect balance of repetitiveness (needed to hook the voters) and diversity (needed to keep them interested). 8 points from me. LATVIA/ Musiqq/ Angel In Disguise: I have a confession to make. I am 100% IN LOVE WITH THIS ENTRY! All thoughts of the runner-up, my beloved Banjo Laura have fled my mind (well, almost – I do still love that too) and I am thrilled with Latvia! What a great song, especially after their “effort” from last year, when Aisha the Bomb bombed out in the semis. 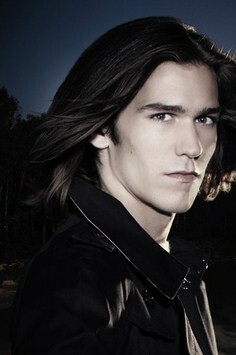 The lead singer is quite nice to look at and his voice is…wow. Not that his looks/talents had any bearing on my decision to give this douze points! I swear. MOLDOVA/ Zdob şi Zdub/ So Lucky: The group who brought us the drum-beating Grandmamma is back in the contest! This song is not a patch on their last, but I like it, particularly the softer parts when they aren’t shouting (about 5% of the song). I would have preferred Natalia Barbu, another returner, to win with Let’s Jazz, but she had to settle for second. And in any case, I’m happy to have ZsZ back on the Eurovision stage. 5, or possibly 6 points from moi. SERBIA/ Nina/ Čaroban: There is a distinct lack of ethnic sounds in the contest at this point, with this song being no exception. The Serbian Duffy has been picked to sing for her country with this extremely sixties-retro track which I think will struggle in the semi. However, I do like it, not half as much as Ovo Je Balkan, but still quite a bit. Nina’s strong vocals are perfectly suited to it. 6 points once again. UKRAINE/ Mika Newton/ Angely: This both gave me goose bumps and restored my faith in Düsseldorf, which at times has looked musically dire. It’s an amazing, powerful, haunting ballad sung to perfection by the angelic (how apt) Mika Newton. I’d like to think this could go all the way…in my head it certainly could. I’ve heard some people bandying ‘Ukraine 2012!’ about the place. Are they psychic? Maybe! Douze points for sure! The standard had certainly been lifted now, with 26 songs heard. Let me know what you think of these six below or on the EBJ Facebook page! With any luck, the level will further increase tonight as Slovenia and Macedonia make their final decisions. One country I feel sure it will increase with is Sweden, who had their last semi final last night, handing out two more direct passes to their final on the 12th of March. Once again I was surprised by the results, which is another way of saying that I was spectacularly wrong in my predictions. It was Linda Bengtzing with E De Fel På Mig, and (unbelievably) Nicke Borg with Leaving Home who qualified first and second respectively, whilst Linda Pritchard’s Alive and Love Generation’s Dance Alone get another chance to make the final. At this point there are only two songs in the Melodifestivalen final that I don’t like, and as I love all of those in the second chance round, the chances of Sweden bringing a great song to the table are good! Well, so long as other people are liking them too, not just me… I’ll have a prediction for Sweden’s Andra Chansen round up by the end of the week. With any luck it’ll be easier to predict than the semi finals! So besides Slovenia and Macedonia, what else is up ahead? Well, on Tuesday, Belarus selects, followed by Greece on Wednesday. Next Saturday, whilst not half as super as this one, brings us the entries from Croatia and Portugal. In addition, there’s two more countries selecting in the week after next, plus several who haven’t given us any dates yet for their national finals/internal selection revelations (Azerbaijan, Armenia, Hungary, San Marino, Russia, et cetera), so keep an eye out for those! And keep counting down to Düsseldorf! A big slice of Turkey with a side serving of Austria: our selection-hungry stomachs are ready for Super Saturday!!! So you’ve heard that this weekend is a big one, have you? Well, yes, lady and/or gent, it sure is! The Academy Awards are on! Finally! But who cares about those? Do you think Colin Firth will be suiting up and sashaying over to the Kodak Theatre tomorrow night just to pick up some shiny statuette? No. If he knows what’s good for him, he’ll be at home in his track pants, in front of his PC, keeping up to date with every development over Eurovision’s most fabulous couple of days (apart from when Eurovision itself is happening, that is). Two such developments now in the past are the selections of returning Austria, and ever-reliable Turkey! Here’s my take on the duo. Austria’s pick, The Secret Is Love by Nadine Beiler, is a half-decent ballad elevated to a higher level by the vocalist. Nadine is amazing live, so we can rely on a great performance from her. But…what’s that? A siren? Oh, it’s the Cliché Police come to arrest the writers of this song for blatant over-use of the words peace, heart and love – in the same sentences. I hope they qualify if simply for the purpose of pepping up a country who had had so little luck in the ESC that they wanted out. Turkey’s pick, Live It Up by Yuksek Sadakat, is not quite a Turkish delight in the vein of Athena, Hadise or my beloved MaNga – in fact, there is nothing remotely Turkish-sounding in it – but I can’t help but like this latest effort, and I’m not even a rock lover. It may be the first of their entries not to qualify to the final since…well, ever, depending on what it is up against. But I like it. And that’s what matters! I jest. So there’s still not a likely winner in the bunch of songs we will see in Düsseldorf at this point. Will one of tonight’s national finals from Serbia, Moldova, Ukraine, Denmark, Estonia, and Latvia produce The One? Will Natalia Barbu, Zdob şi Zdub, Anastasiya Prikhodko or Lauris Reiniks get another chance at glory? We’ll find out soon enough. In the meantime, check out eurovision.tv for all the national final details. Melody Club/ The Hunter: I’m sure this will make a good opener for the semi, and although it ain’t my particular cup of tea, I’m predicting an advance here. For some reason it reminds me of the 2009 Swiss entry, The Highest Heights. Like I did that, I don’t hate it; I don’t love it. Julia Alvgard/ Better Or Worse: I may have a bias towards this song as I heard it a few months ago, but when I did hear it that first time, I adored it. Brilliant song, great vocalist – L. O. V. E! But I’m not sure it will be as well received with the juries/public as it was with me. It may be a tad too slow to win them over, so I’m thinking it might miss out on a place in the final/second chance round. Linda Pritchard/ Alive: Apart from the lyric ‘something came alive’ which reminds me of Michael Myers rising up behind Jamie Lee Curtis (who thinks she’s finished him off) in Halloween, I quite like this track. I’m a sucker for a good ballad, and I would class this as so – basically because it was practically cliché free (and if you’re a regular reader, you’ll know how much I despise clichés). Anders Fernette/ Run: This is not half as infectious as Don’t Stop, the song that Anders was supposed to sing here but which got disqualified for being published too early by the…oh, you don’t need to know that. I like the chorus, despite how repetitive it is. But isn’t repetitiveness a staple of Melodifestivalen (no offence)? Its main downfall is that it stays at the same level from start to end. Linda Bengtzing/ E De Fel På Mig: Very schlager! This one’s quite catchy, but not overly original, however I love that it’s in Swedish – there really aren’t many non-English songs in MF this year, and I love the sound of Swedish in song. Nicke Borg/ Leaving Home: WARNING: I am about to make an Australian reference that the majority of you will not understand. Here goes: isn’t this The Whitlams’ latest single? No? Fair enough. Anyway, no offence to T.Whits, but this song is almost as boring as Lasse’s. A cupcake without icing. Love Generation/ Dance Alone: The good news: these four lovely ladies do NOT shout out ‘RedOne!’ at the beginning of the song a lá Gaga. Plus, this being a fairly catchy club track with pedigree, should mean it qualifies. The bad news: It didn’t really meet my expectations. I thought it would stand right out from the rest and it just didn’t. My predictions for the two top ticket winners would have to be Melody Club and Love Generation, whilst I’m guessing Anders Fernette and Linda Bengtzing will have to battle it out in Andra Chansen. Whether it’s Melodifestivalen that floats your boat, or one (or all) of the national finals happening around the continent this evening, I hope you enjoy them, and may the best song win each and very one of them.